CinemaScience provides reference viewers and flexible components for users to build application specific viewers. The basic viewers are introduced here. A full viewer tutorial is available at Tutorial: Cinema Viewers. 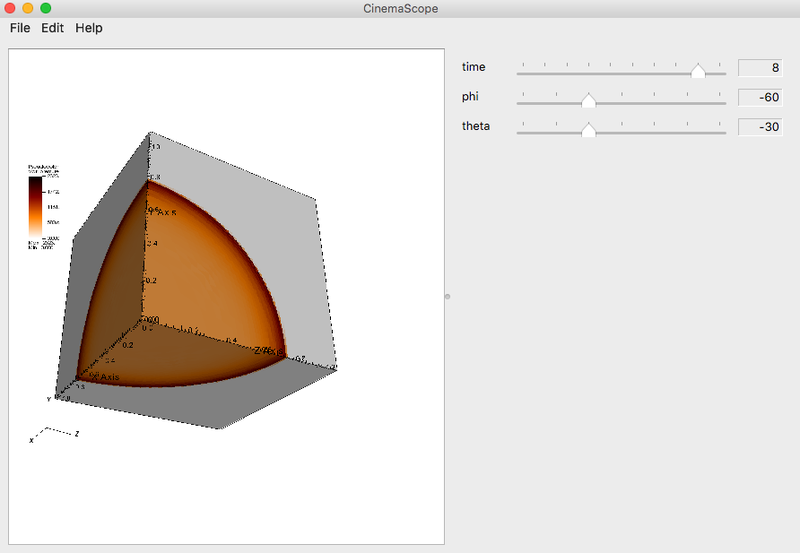 CinemaCompare is an interactive visualization approach to exploring Spec D Cinema databases. It can be used with single databases to rotate around a visualization as with the MPAS-Ocean simulation. CinemaCompare can also be used to compare multiple databases as with this Warp plasma accelerator visualization that compares (left) isosurfaces found with a topological analysis versus (right) isosurfaces based on regular spacing. CinemaCompare can be found at cinema_compare and its tutorial is at CinemaCompare. CinemaExplorer is a browser based viewer for Spec D databases. It includes a parallel coordinates view and a scatterplot view. The columns are the data artifacts or derived quantities that are defined in the data.csv file for the Spec D database. This example is shows the dark matter density from the Nyx cosmological simulation. Note how one can choose a subset of the images to view by selecting a region along one of the variable axes. CinemaExplorer can be found at cinema_explorer and its tutorial is at CinemaExplorer. CinemaScope is a prototype multi-platform viewer application that allows the user to interactively explore a Cinema database of images, through both sliders and mouse controls. CinemaScope is compatible with Sped C CDBs. In this image, a Sedov blast wave is viewed in CinemaScope. CinemaScope can be found at cinema_scope and its tutorial is at CinemaScope. cinema_newsfeed A pipeline approach to present analysis results to the user. cinema_quest An interactive visual tool for querying Cinema Database ensembles. 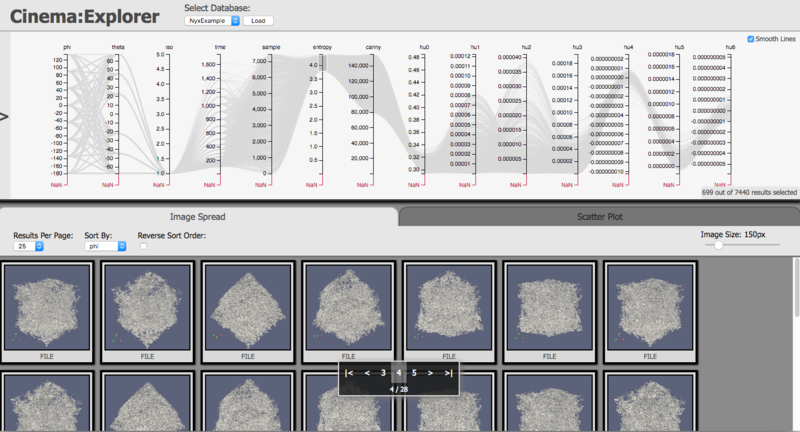 cinema_bandit A multi-view application for analysis and visualization of experimental data. cinema_debye_scherrer An interactive web-based tool to visualize multiple datasets. cinema_simpleviewers A set of simple viewers to be used as examples to create custom Cinema viewers. cinema_unityviewer An experimental viewer based on the Unity game engine.